Rustic wooden coffee tables and wood lamps add both a rustic and sophisticated vibe to this living room. If you’re someone who has grown up in the country, you will more often than not, recall rustic furnishings as one of the most beautiful part of your home’s interior. One of the simplest ways to achieve the rustic look is by adding wood and wooden items into your home. Wood is a classic and versatile material that can be played around with in many ways when decorating your home. From kitchen tables and counters to flooring and shelves, there are more than a few ways you can incorporate wood to match rustic and vintage themes. Check out this white neutral space below captured beautifully by Emma Lewis Photography of Anton and K Antiques'. It hits all the buttons of rustic farmhouse decor. The wooden whitewashed beams. 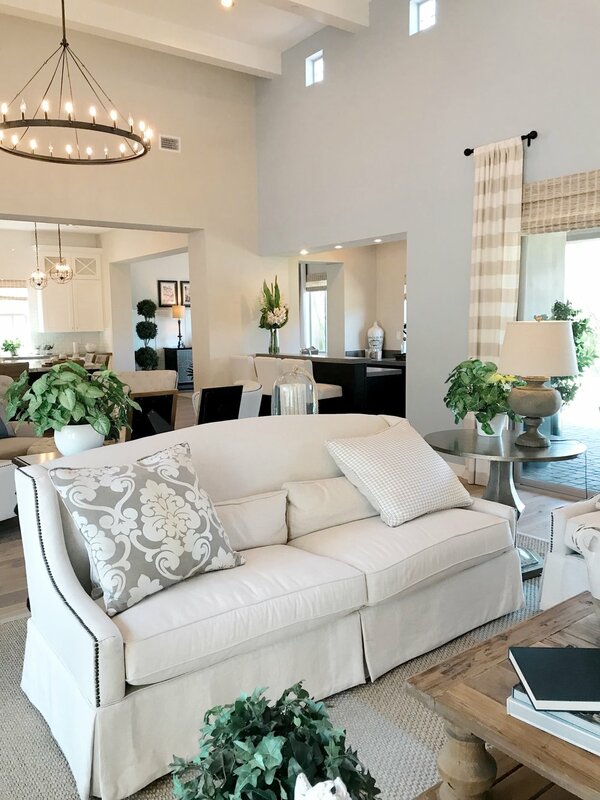 Now, not everyone is lucky enough to have a space with this type of "bones" but there are many faux beams on the market that can be added at a fraction of the cost of real beams. Simple white wood shutters adorn the windows. Natural tones mixed in with the white, add both a warm and inviting vibe. So, How Can You Achieve The Look? Since wood is so versatile, there are many ways you can incorporate it into your rustic décor. You can never overdo home décor with the use of wood! Whether your home has beautiful, exposed natural beams or you’re looking for creative ways to add a rustic theme to your interior, there are a number of ways you can use wood in your home. From adding antique wooden doors you purchase at antique shows or flea markets to shelves and hand-carved wooden accessories, the possibilities to incorporate wood are endless! If you’re looking for inexpensive ways to achieve rustic décor, consider starting small. A wooden wall clock, coasters and smaller accessories are simple ways to get started on the project. Since wood is one of the easiest materials to get crafty with, consider going through some online tutorials and get creative! Pull out your tool box and play around with design options. You can even consider recycling wooden pallets to create shelves for planters and books. If you’re not feeling crafty, you can look for a wooden trunk to make for an elevated space to place a vase or small decorative items. Adding wooden flooring is a charming and classic way to introduce wood into your home. Although this option can be slightly pricier, there are many options that can suit the rustic style you may be looking for. Like these beautiful herringbone wood floors by Hudson Home Builders. They are spectacular! The versatility of wood ensures it can be incorporated into any theme that you like. So, if you’re going for a more rustic and vintage theme, think more in terms of wooden wardrobes, drawers and shelves. Are you looking for farmhouse style themes to add to your rustic and vintage themes for home décor? Check out the accessories and antiques from The Grey Antler to match your style. Visit our blog for more home décor tips and inspiration! For orders and queries, drop us an email at Shop@TheGreyAntler.com or visit our Facebook page!